I generally try to avoid commenting on monetary policy. Not because I don’t have opinions, but for the simple reason that I don’t follow the issue closely enough to feel fully confident about what I say. 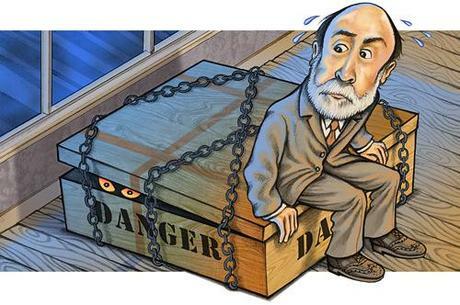 This doesn’t mean I’m happy with Fed Chairman Bernanke. But I’m most likely to be upset that he is making misguided statements about fiscal policy (endorsing the faux stimulus, endorsing bailouts, endorsing tax increases, and siding with Obama on the debt-limit fight). On monetary policy, as I’ve previously explained, it’s possible that “easy money” is the right approach. I’m skeptical, but I admitted on CNBC that the TIPS data does suggest that future inflation is not a problem. So with all these caveats out of the way, I don’t embrace everything in this video, which is very critical of the Fed, but it’s amusing and worth sharing. If you find it even remotely interesting and/or amusing, then you definitely should watch the famous Ben-Bernank-quantitative-easing video. And if you want to actually understand more about the Federal Reserve and monetary policy, then you should watch this video on the history of the Fed featuring Professor George Selgin. Ben Bernanke is definitely trying hard to overtake Arthur Burns and G. William Miller (those wonderful guys who helped give us the 1970s) as the worst Fed Chairman of the modern era. But unlike Burns and Miller, who “earned” their poor reputations with bad monetary policy, Bernanke is trying to cement his place in history by being a stooge for the big-government policies of the Washington establishment (he also is getting lots of criticism for QE2 and other monetary policy actions, but let’s give Bernanke the benefit of the doubt and assume all those decisions will somehow work out for the best). Bernanke frequently pontificates about the supposed horrors of deficits and debt (I write “supposed” because the real problem is spending, with red ink being a symptom of a government that is far too large). Yet he endorsed Obama’s failed stimulus. He’s also asserted that reducing the burden of government spending would hurt the economy. And he was an avid supporter of the TARP bailout. Now he’s trying to discourage GOPers from seeking budgetary savings as part of a proposed increase in the debt limit. Here’s a blurb from the AP report. Federal Reserve Chairman Ben Bernanke on Tuesday urged Republicans to support raising the nation’s borrowing limit. He said threatening to block the increase to gain deeper federal spending cuts could backfire and worsen the economy. Even a short delay in making payments on the nation’s debt would cause severe disruptions in financial markets, damage the dollar and raise serious doubts about the nation’s creditworthiness, Bernanke said. By the way, I’ve previously debunked Bernanke’s demagoguery about disrupted financial markets. The federal government this year will collect 10 times as much revenue as needed to service the national debt. What it would actually demonstrate, though, is that Bernanke is a tool for big government. Could Technical Default Today Save America from Greek-Style Fiscal Disaster in the Future? There’s a lot of buzz about a Wall Street Journal interview with Stanley Druckenmiller, in which he argues that a temporary delay in making payments on U.S. government debt (which technically would be a default) would be a small price to pay if it resulted in the long-term spending reforms that are needed to save America from becoming another Greece. Mr. Druckenmiller is not overly impressed by this hyperbole. The article continues with this key passage. This is a very compelling argument, but it overlooks one major problem – the complete inability of Republicans to succeed in forcing fiscal reform using this approach. For all intents and purposes, this is what happened with the TARP vote in 2008. There were basically two choices of how to deal with the financial crisis. The establishment wanted a blank-check bailout, while sensible people wanted the “FDIC-resolution” approach (similar to what was used during the savings & loan bailouts about 20 years ago, which bails out retail customers but wipes out shareholders, bondholders and senior management). Republicans initially held firm and defeated the first TARP vote, but then they folded when the Washington-Wall Street establishment scared markets. I hope I’m wrong in my analysis, but I don’t see how Republicans could win a debt limit fight. At least not if they demand something like the Ryan budget. The best possible outcome would be budget process reform such as Senator Corker’s CAP Act, which would impose caps on future spending, enforced by automatic spending cuts known as sequestration. Because it postpones the fiscal discipline until after the vote, that legislation has a chance of attracting enough bipartisan support to overcome opposition from Obama and other statists.